Studies of test performance (or accuracy) compare test results between groups of patients with and without the target disease, each of whom undergoes the experimental test as well as a “gold standard” diagnostic investigation to ascertain disease status. The relation between the test results and disease status is described using probabilistic measures, such as sensitivity, specificity, likelihood ratios, diagnostic odds ratios (box), and receiver operating characteristic curves (box). 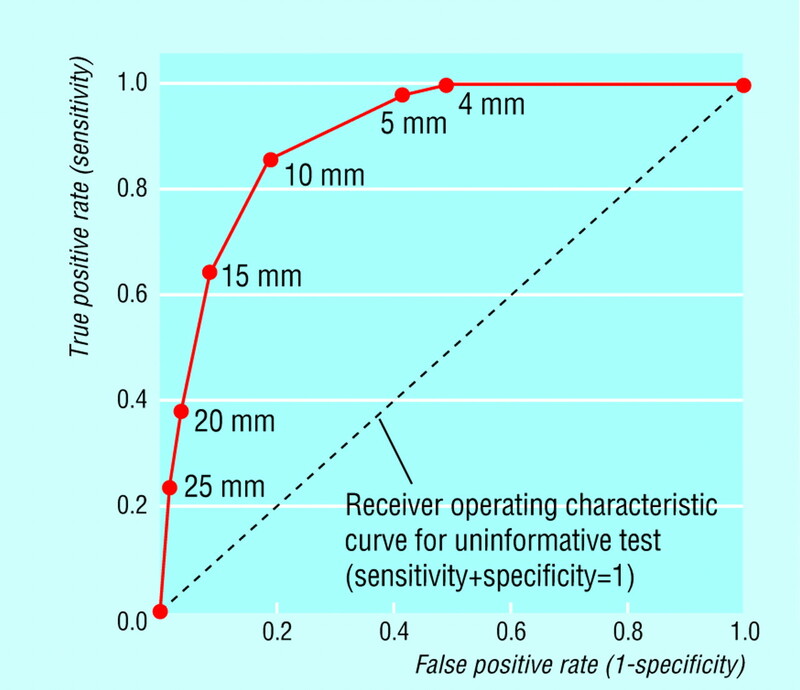 Receiver operating characteristic curves are used in studies of diagnostic accuracy to depict the pattern of sensitivities and specificities observed when the performance of the test is evaluated at several different diagnostic thresholds. Figure 1 is a receiver operating characteristic curve from a study of the detection of endometrial cancer by endovaginal ultrasonography.8 Women with endometrial cancer are likely to have increased endometrial thicknesses: few women who do not have cancer will have thicknesses above a high threshold whereas few women with endometrial cancer will have thicknesses below a low threshold. This pattern of results is seen in figure 1, with the 5 mm threshold showing high sensitivity (0.98) but poor specificity (0.59) and the 25 mm threshold showing poor sensitivity (0.24) but high specificity (0.98). To be reliable a systematic review should aim to include only studies of the highest quality. Systematic reviews may either exclude studies that do not meet these criteria and are susceptible to bias or include studies with a mixture of quality characteristics and explore the differences. 3 5 Whichever approach is adopted, it is essential that the quality of the studies included in the review is assessed and reported, so that appropriately cautious inferences can be drawn. A recent empirical study evaluated which aspects of design and execution listed in table 1 are of most importance.13 The most notable finding related to the design of the study. Studies that recruited participants with disease separately from those without disease (for example, by comparing a group known to have the disease with a group of healthy controls) overestimated diagnostic accuracy when compared with studies that recruited a cohort of patients unselected by disease status and representative of the clinical population in which the test was used. Studies that used different reference tests according to the results of the experimental test also overestimated diagnostic performance, as did unblinded studies. Omission of specific details from the report of the study was also associated with systematic differences in results. Meta-analysis is a two stage process involving derivation of summary statistics for each study and computation of a weighted average of the summary statistics across the studies.14 I illustrate the application of three commonly used methods for pooling different summaries of diagnostic accuracy with a case study. As with systematic reviews of randomised controlled trials, meta-analysis should be considered only when the studies have recruited from similar patient populations (it is problematic to combine studies from general practice with studies from tertiary care), have used comparable experimental and reference tests, and are unlikely to be biased. Even when these criteria are met there may still be such gross heterogeneity between the results of the studies that it is inappropriate to summarise the performance of a test as a single number. Smith-Bindman et al published a systematic review of 35 studies evaluating the diagnostic accuracy of endovaginal ultrasonography for detecting endometrial cancer and other endometrial disorders.15 All studies included in the review were of prospective cohort designs and used the results of endometrial biopsy, dilation and curettage, or hysterectomy as a reference standard. Most of the studies presented sensitivities and specificities at several endometrial thicknesses detected by endovaginal ultrasonography (the receiver operating characteristic curve in figure 1 is from one of these studies). The case study is based on the subset of 20 studies from this review that considered the diagnostic accuracy of endovaginal ultrasonography in ruling out endometrial cancer with endometrial thicknesses of 5 mm or less. Figure 2 shows the sensitivities and specificities for the 20 studies. One important extra source of heterogeneity is variation introduced by changes in diagnostic threshold. Studies may use different thresholds to define positive and negative test results. Some may have done this explicitly—for example, by varying numerical cut-off points used to classify a biochemical measurement as positive or negative, whereas for others there may be naturally occurring variations in diagnostic thresholds between observers, laboratories, or machines. The choice of a threshold may also vary according to the prevalence of the disease—when the disease is rare a more extreme threshold may have been used to avoid large numbers of false positive diagnoses. Unlike other sources of variability, variation of the diagnostic threshold introduces a particular pattern into the receiver operating characteristic plot of study results, such that the points show curvature (fig 1). If there is no heterogeneity between the studies, the best summary estimate of test performance should be a single point on the receiver operating characteristic graph. The first two methods estimate such a summary, first by pooling sensitivities and specificities then by pooling positive and negative likelihood ratios. The third method is more complex and pools diagnostic odds ratios to take account of possible heterogeneity in diagnostic threshold. The pooled estimate of sensitivity is 0.96 (95% confidence interval 0.93 to 0.99) and is depicted by the horizontal line on the receiver operating characteristic plot in figure 3 (left). The overall estimate of mean specificity is lower: 0.61 (0.55 to 0.66). Heterogeneity is, however, clearly evident in figure 3 (left): although the study points lie reasonably close to the summary sensitivity (test for heterogeneity, P=0.04), the results of many studies lie some distance from the summary specificity (test for heterogeneity, P<0.001). Regardless of the causes of the heterogeneity, the overall high estimate and relative consistency of the sensitivity results does suggest that a negative test result could be of potential clinical use in ruling out endometrial cancer. As there is heterogeneity between specificities, however, it is more appropriate to note the range of specificities (0.27 to 0.88) rather than to quote the average value of 0.61. It is difficult to draw a conclusion about test specificity: the observed values vary considerably and there is no understanding from this analysis as to the reasons for the variation. For the case study the pooled estimate of the positive likelihood ratio was not particularly high (2.54, 2.16 to 2.98), and the values varied significantly between the studies (test for heterogeneity, P<0.001). In figure 3 (centre) it is clear that the summary positive likelihood ratio lies some distance from many of the values. 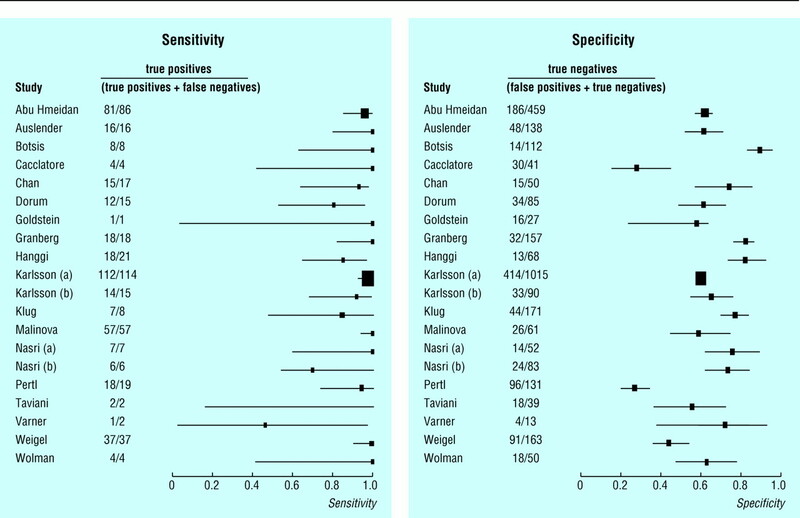 Again it is debatable whether reporting the average value of such heterogeneous results is sensible, but it is unlikely that a positive test result could provide convincing evidence of the presence of endometrial cancer as the positive likelihood ratios are all below 10 (data not shown). The negative likelihood ratios show no evidence of significant heterogeneity (test for heterogeneity, P=0.09), the pooled estimate being 0.09 (0.06 to 0.13), with the summary line on the receiver operating characteristic plot in figure 3 (centre) lying close to the results of most of the studies. This finding again shows that a measurement of an endometrial thickness of 5 mm or less made by endovaginal ultrasonography can provide reasonably convincing evidence to rule out endometrial cancer. Although these conclusions concerning potential diagnostic use are similar to those obtained by pooling sensitivities and specificities, the summaries obtained by pooling likelihood ratios can be more easily interpreted and applied to clinical practice. The box describes how the summary negative likelihood ratio can be applied to estimate the probability of endometrial cancer in a woman with a negative test result. How is a summary receiver operating characteristic curve estimated? The simplest approach involves calculating a single summary statistic for each study—the diagnostic odds ratio (box). Each diagnostic odds ratio corresponds to a particular receiver operating characteristic curve. If the studies in a review all relate to the same curve they may have consistent diagnostic odds ratios even if they have variable sensitivities and specificities. Table 2 gives examples of diagnostic odds ratios corresponding to particular sensitivities, specificities, and positive and negative likelihood ratios. In the case study it is possible that some of the observed heterogeneity could be explained by a threshold effect, perhaps due to differences in calibration of the ultrasound machines. The estimate of the summary diagnostic odds ratio is 28.0 (18.2 to 43.2) and is reasonably consistent across the studies (test for heterogeneity, P=0.3), suggesting that the points indeed could have originated from the same receiver operating characteristic curve. The summary diagnostic odds ratio can be interpreted in terms of sensitivities and specificities by consulting table 2 (for example, a diagnostic odds ratio of 29 corresponds to a sensitivity of 0.95 and a specificity of 0.60 and to a sensitivity of 0.60 and specificity of 0.95) or by plotting the corresponding summary receiver operating characteristic curve (fig 3 (right)). This method does not yield a unique joint summary estimate of sensitivity and specificity: it is only possible to obtain a summary estimate of one value by specifying the value of the other. This greatly limits its clinical application. Systematic reviews of diagnostic accuracy have not, as yet, made the same impression on the practice of evidence based health care as have systematic reviews of randomised controlled trials. Reasons relate to reliability, heterogeneity, and clinical relevance. Are systematic reviews of diagnostic studies reliable? The reliability of a review also depends crucially on whether the included studies are an unbiased selection. As with all reviews, systematic reviews of diagnostic tests are susceptible to publication bias, and this may be a greater problem than for randomised controlled trials. 2 3 No investigations, however, have been conducted to estimate rates of publication bias for studies of diagnostic accuracy. How useful are systematic reviews to a practising clinician? Heterogeneity of the results of studies of diagnostic accuracy is common but in itself does not prevent conclusions of clinical value from being drawn.22 Despite heterogeneity being observed in the case study, it was still possible to draw a conclusion of clinical value—that an endometrial thickness of 5 mm or less can rule out endometrial cancer. Diagnostic odds ratios and summary receiver operating characteristic curves are, however, often promoted as the most statistically valid method for combining test results when there is heterogeneity between studies, and they are commonly used in systematic reviews of diagnostic accuracy.2–4 Unfortunately summary curves are of little use to practising healthcare professionals: they can identify whether a test has potential clinical value, but they cannot be used to compute the probability of disease associated with specific test outcomes. Their use is also based on a potentially inappropriate and untested assumption that observed heterogeneity has arisen through variation in diagnostic threshold. In the case study, whereas the diagnostic odds ratio was a reasonably consistent summary statistic across the studies, there was no evidence to suggest that the observed heterogeneity arose through variations in diagnostic threshold (all included studies had a 5 mm threshold for endometrial thickness). Variation in referral patterns, sample selection, and study methods may be more likely explanations for the heterogeneity. There is no clear statistical advantage in using a summary receiver operating characteristic approach to synthesise the results over pooling sensitivity and specificity or likelihood ratios unless there is a threshold effect. Empirical research is urgently required to find out whether the simpler methods for pooling sensitivities, specificities, and likelihood ratios are likely to be seriously misleading in practice and whether apparent threshold effects are really due to variations in diagnostic threshold rather than alternative sources of heterogeneity. Are studies of diagnostic accuracy clinically relevant? Systematic reviews of the accuracy of tests do not always answer the most clinically relevant question. New tests are often evaluated for their ability to replace or be used alongside existing tests. The important issues are comparisons of tests or comparisons of testing algorithms: these would be best addressed in properly designed comparative studies, rather than by synthesising studies of diagnostic accuracy separately for each test. The evaluation of the diagnostic accuracy of a test is also only one component of assessing whether it is of clinical value. 23 24 Treatment interventions are recommended for use in health care only if they are shown on average to be of benefit to patients: the same criterion should also be applied for the use of a diagnostic test, and even the most accurate of tests can be clinically useless or do more harm than good. It should always be considered whether undertaking a systematic review of studies of diagnostic accuracy is likely to provide the most useful evidence of the value of a diagnostic intervention. I thank Rebecca Smith-Bindman for providing the data for the case study. Systematic Reviews in Health Care: Meta-analysis in Context can be purchased through the BMJ Bookshop (http://www.bmjbookshop.com/); further information and updates for the book are available on http://www.systematicreviews.com/. .Clinical epidemiology: a basic science for clinical medicine2nd ed.Boston: Little, Brown,1991. .Guidelines for meta-analyses evaluating diagnostic tests.Ann Intern Med1994;120:667–676. .Meta-analytical methods for diagnostic test accuracy.J Clin Epidemiol1995;48:119–130. .Recommended methods [updated 6 Jun 1996]. (accessed 27 March 2001). .Meta-analyses of studies of diagnostic accuracy of laboratory tests: a review of concepts and methods.Arch Pathol Lab Med1998;122:675–686. .Systematic reviews of evaluations of diagnostic and screening tests. In: Egger M, Davey Smith G, Altman DG eds.Systematic reviews in health care: meta-analysis in context2nd ed.London: BMJ Books,2001. .Diagnostic tests. 1: Sensitivity and specificity.BMJ1994;308: 1499. .Evaluating diagnostic tests.Baillière's Clinical Obstetrics and Gynaecology1996;10:613–630. .Users' guides to the medical literature. VI. How to use an article about a diagnostic test. B: What are the results and will they help me in caring for my patients?JAMA1994;271:703–707. .Users' guides to the medical literature. VI. How to use an article about a diagnostic test. A: Are the results of the study valid?JAMA1994;271:289–291. .Assessing the quality of a diagnostic test evaluation.J Gen Intern Med1989;4:288–295. .Use of methodological standards in diagnostic test research. Getting better but still not good.JAMA1995;274:645–651. .Empirical evidence of design-related bias in studies of diagnostic tests.JAMA1999;282:1061–1066. .Statistical methods for examining heterogeneity and combining results from several studies in meta-analysis. In: Egger M, Davey Smith G, Altman DG eds.Systematic reviews in health care: meta-analysis in context2nd ed.London: BMJ Books,2001. .Endovaginal ultrasound to exclude endometrial cancer and other endometrial abnormalities.JAMA1998;280:1510–1517. .Heterogeneity in systematic reviews of diagnostic studies. In:Proceedings of the 2nd symposium on systematic reviews: beyond the basics.Oxford,1999. Abstract available at on (accessed 27 March 2001). .Biostatistics in clinical medicine3rd ed.New York: McGraw-Hill,1994:26–50. .Issues in combining independent estimates of the sensitivity and specificity of a diagnostic test.Acad Radiol1995;2: 37–47S. .Combining independent studies of a diagnostic test into a summary ROC curve: data-analytical approaches and some additional considerations.Stat Med1993;12:1293–1316. .Comparative diagnostic performance of three radiological procedures for the detection of lumbar disk herniation.Meth Info Med1990;29:12–22. .Estimating diagnostic accuracy from multiple conflicting reports: a new meta-analytical method.Med Decis Making1993;13:313–321. .The science of systematically reviewing studies of diagnostic tests.Clin Chem Lab Med2000;38:577–588. .Using evaluations of diagnostic tests: understanding their limitations and making the most of available evidence.Ann Oncol1999;10:761–768. .A framework for clinical evaluation of diagnostic technologies.Can Med Assoc J1986;134:587–594.